Nearly every surface of the city was slick with ice when Angela Wallace left home to pick up her children after school on February 7. She was careful as she walked down her stairs but slipped on the final step, striking the back of her head on a wall. Suspecting a concussion, her worries were confirmed in the emergency room. Accidents like Wallace’s are a top concern for property owners fearful of being sued for slip and falls on their icy premises. 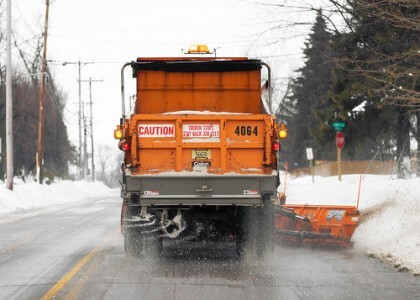 For that reason, many use exorbitant amounts of road salt to avoid legal repercussions. Indeed, keeping sidewalks and roads cleared is critical for the safety of all pedestrians and drivers in the city. But even Wallace, a project manager with Toronto and Region Conservation Authority (TRCA), will argue that we are collectively overdoing it. Every year, more than 120,000 tonnes of salt is dumped on Toronto pavement. And the impact of that sodium chloride, once the ice and snow melts away, can be devastating to our city’s natural and built environments. “In highly urbanized area, most of the fish and bugs, if they were sensitive to chloride, they’ve either left or died already,” says Wallace, whose work focuses on watershed monitoring and reporting. She likens aquatic species’ aversion to salty water to humans’ intolerance of the atmosphere of outer space. “Once road salt starts going into the stream, it changes the atmosphere they’re living in. It’s also very dehydrating,” Wallace explains. What’s left are hardy organisms that can tolerate urbanized watersheds and their high levels of salt. One sensitive fish of particular concern is the Redside Dace. The minnow is native to North America and, in Canada, it’s only found in Ontario. With more and more urbanization in the province coupled with persistent overuse of road salt, the fish is teetering on extinction. It’s not just the watersheds that are affected by corrosive compound. In 2001, Environment Canada released a detailed five-year study on the environmental impact of road salt. They concluded that, at the current levels being used, salt was harmful to freshwater ecosystems, as well as soil, vegetation, drinking water, and wildlife in general. Road salt was designated as a toxic substance. “Usually when you declare a substance as toxic, regulations follow,” says Tim Van Seters, Senior Manager, Sustainable Technologies Evaluation Program (STEP) at TRCA. But that’s not quite what happened. Instead, a multi stakeholder committee created a voluntary code of practice—recommendations, if you will—for the environmental management of salt. You can learn more about salt management and ongoing STEP research and results HERE.